I am probably the last person you would expect to own a grocery store, and yet, I do. In fact, I own three. I am a Midwestern, married suburban mother of two, my car is twelve years old and most of my fashion finds come from the thrift store. I don’t fit the bill for corporate honcho, and my bank account corroborates that truth. So how do I manage to own not one but three successful grocery stores? I guess in true “industry disruptor” style, I found a unique solution to a common problem: how to get the kind of food I want, and have my voice heard by a place where I shop. That solution is food co-ops. My local food co-op offers me fresh local food, a way to support my community and the opportunity to invest in the co-op, ensuring it remains a resource in our community for good. I can still remember the first time I tried a fresh, organic and locally grown sugar snap pea. The crisp, tender pod was a shimmering, almost translucent spring green, the texture was light and juicy and crunchy, the flavor sweet and slightly floral in a way that only a freshly picked pea can taste. I had this amazing experience in the produce aisle of my co-op, the specimen unceremoniously thrust at me by a tall guy with a beard and a flannel shirt, the very same guy, it turned out, who had grown the peas, picked them early that morning and brought them to the store to sample to customers, like me. As a sales technique, it worked, you better believe I bought some. But unpredictably, it had a life-changing effect on me because it opened my eyes to the existence, and value, of locally grown food. It turns out that locally grown food is not just better tasting, it’s better for the local economy because it keeps people employed in the rural areas that surround where I live and it’s traveled a much shorter distance to arrive on my plate. Another unexpected bonus of buying locally grown food has been that fresher vegetables actually have more plant sugar in them (it’s chemistry!) so they have been a much easier sell for my kids. When vegetables taste the way nature intends them, people more naturally enjoy them. It’s neat how that works. Most of us don’t expect a lot more than food out of our grocery store, but why shouldn’t we? Eating is one of life’s greatest pleasures but to be real, it’s one of its greatest chores, too. Buying and eating food is not optional, so it makes sense that we should have somewhere to buy food that is just here to help us meet that basic need, not to make money for business executives that live in other states. I don’t know about you, but I am tired of sending my money to Wall Street while Main Street closes up shop. Food cooperatives are locally owned by the people that shop there, like me, and my investment means that I get to vote for our board of directors and weigh in on important governance changes. If I wanted to, I could even run for the board! Even better, when I buy food at my co-op more of the money I spend goes back to the local community via local producers and patronage refunds (a return on your investment, similar to a stock dividend or profit sharing but your amount is proportionate to how much you spend). Also, co-ops provide good jobs, most of them with benefits, to people in my neighborhood. Because co-ops are community-based (and because I’m an owner!) it’s easy for me to see how my shopping choices can benefit my community directly. There are many reasons why it’s smart and fun (yes, fun!) to shop at and invest in your local food co-op, I could never cover all the reasons here. For me, shopping the co-op is a great way to get the fresh, local and healthy food that I love (plus super tasty treats and snacks!) and at the same time, participate in an organization that is working to meet the needs of my community first and foremost. That community focus will never change as long as it exists, because that’s what being a co-op means, and that’s what makes it different from other stores. Just like you don’t need a wallet full of Benjamins to own a food co-op, you don’t need a Ph.D. to know that co-op ownership just makes sense. Joining a food co-op is easy. 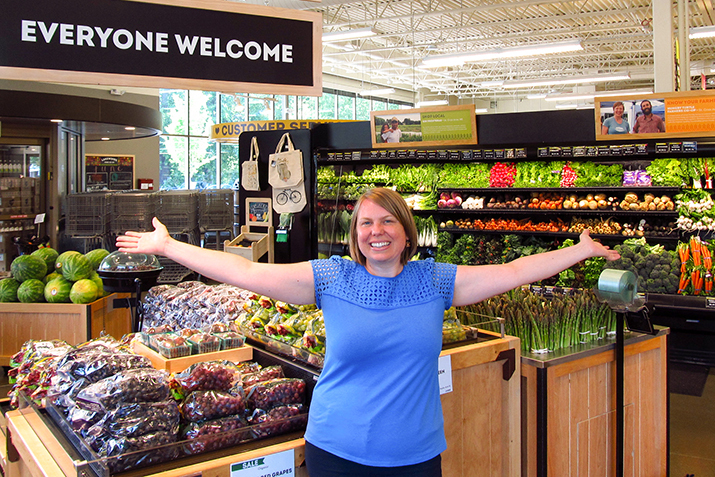 Locate a food co-op near you to find out what they offer and how you, too, can own a grocery store!